The Nuheat Floor Heating Mats are easy to install and are available in just about any size you may need. Radiant floor heat may be the most cost efficient way to warm hard-to-heat areas of your home or any area! Imagine getting out of bed on a cold winter morning and stepping onto a toasty warm floor. And since the entire floor is heated, an even heat, with no cold spots, will rise to meet you providing comfort wherever you are. Heated flooring may be the best thing you do for you and your home! The 240 Volt Nuheat Floor Heat Mat options are available in lengths from 5 feet to 20 feet. Each square or rectangular floor mat can be laid in either direction. The 6 Foot Series of Nuheat Floor Heat Mats is available in various widths to meet all of your needs. All mats in this series are 72 inches long. Available widths in this series include 30" (G1808), 36" (G1809), 42" (G1810), 48" (G1812), 60" (G1815), and 72" (G1818). Nuheat floor mats are pre-wired and cannot be cut, but they can be laid in either direction so if the width and length don't match your needs, you can turn it. Whether you are remodeling an entire house, a bathroom, a kitchen or even finishing a basement, the Nuheat Floor Heating System may be exactly what you need! A Nuheat Floor System can be installed for use under tile, stone, marble, laminate or engineered wood floors. Nuheat floor mats offer an invisible, maintenance-free heating solution. Each room will also require a thermostat. If your room's layout is more complex than a basic square or rectangle, you can lay more than one mat side by side, and still have it controlled by the same thermostat (up to the 15 amp limit of the thermostat). All mats connect to the thermostat, not to each other. DO NOT EVER CUT A NUHEAT MAT TO FIT YOUR SPACE. Energy efficient - up to 12 watts/sq. ft.; 41 BTUs/ sq. ft. The Nuheat electric floor heating mats are almost all DIY - an electrician is needed to install a dedicated line. If your room already has a dedicated line and you are well versed in electrical installations, you may not need an electrician. 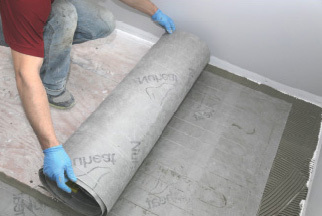 Simply lay your thinset, roll out and press the Nuheat mat right onto the thinset, apply another layer of thinset and install your flooring. Of course, there are small interim steps but overall the installation is pretty straightforward. The biggest thing to worry about is making sure the electrical line that will be attached to the thermostat is coming up in the right place in your room! The entire 240 Volt Nuheat Mat Size Chart includes all of the various sizes including the Dimensions, Ohms, Amps and Watts. If you have special room needs, perhaps an island in your kitchen or your floor's footprint is oddly shaped, Nuheat even offers custom mats. You need to provide them with a hand drawn floor plan with your requirements and they will work with you to build your custom floor mat (custom floor mats require 2 weeks from drawing approval and are non-returnable). If you are interested in a Custom Nuheat Floor System, please contact Customer Service at 877-847-0050 or send us an email at support@totalhomesupply.com for further information. Floor Mat Width: Required Choose Options 30" 36" 42" 48" 60" 72"